Mobile version: Probably one of the most requested missing features. 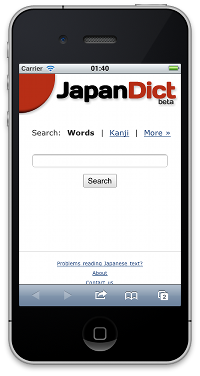 Now you can browse and query the dictionary using your mobile device. Speed improvements: We’ve implemented caching and reduced the downloaded data in all the site, so all the site will be much faster than before. Try it! Minor aesthetic improvements. Mainly small fixes that will make the site more beautiful than before. Please, don’t hesitate to post your comments and opinions here so we can improve the site as much as possible. An option to choose the number of displayed words/page on lists would be a welcome addition. Gracias por esforzarse tanto!!!! Es maravilloso tener un lugar como este en el que uno pueda consultar y aprender. Espero verlos crecer cada vez más.